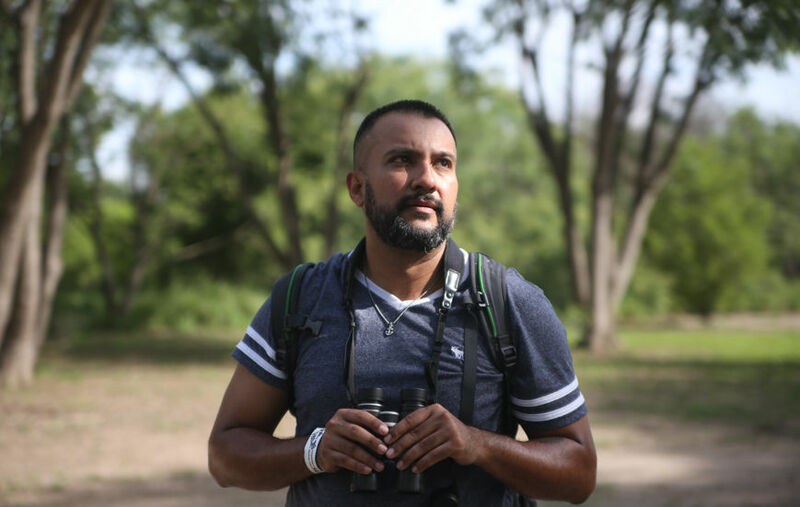 Monitor Features Editor Peter Rasmussen takes part in a RGV Family Summer Adventure challenge — bird watching. The summer-long program encourages families to explore the outdoors during the summer. MISSION — For my first outdoor adventure, I went bird watching at Bentsen-Rio Grande Valley State Park. I am taking part in the RGV Family Summer Adventure Challenge, a summer-long program designed to encourage families to explore the outdoors. Families are tasked with competing 12 challenges at at least four nature sites in the Valley. Families have until Aug. 26 to complete the challenges. The program is free and open to families with children under the age of 18. One of the challenges is to go bird watching. The Valley is a hot spot for birding because many birds migrate through this area. People from all over the world flock to deep South Texas to see if they can spot a rare bird. Avid bird watchers take pride in discovering a new species of birds in the Valley, which they can have verified. More than 500 bird species have been seen in the Valley. That is more than half of all bird species found in the United States, according to the Edinburg Scenic Wetlands and World Birding Center. The newset bird to make a pit stop in the Valley was the verigated flycatcher, which was spotted last year at South Padre Island. I figured the Valley tradition of bird watching was a great way to begin my challenges. I learned quickly that it is a slow-paced activity. If you’re walking fast, you’ll miss the birds. You have to be on a constant lookout and quick with your binoculars. “Spot the bird and then bring the binoculars to your eyes,” Park Ranger Amber Schmitt told me. That is sound advice for someone who has limited experience with binoculars. Once I got a handle of the binoculars, I felt like a real bird watcher (well, in my mind). Bird watching is very calming and relaxing. Although I didn’t get to see an oriole, I saw an oriole nest which was suspended from a couple of outstretched, weak-looking branches of a tree. I was assured by Schmitt that the nest was not heavy and not in danger of falling despite its precarious position. To be honest, the bird watching quickly became secondary to the park itself. In my 12 years in the Valley, I never visited Bentsen State Park. The biggest reason I joined the program was to explore the various nature sites in the Valley. Bentsen did not disappoint. You can bike, fish, run, camp, bird watch, picnic in a scenic location. I will be going back. That is what the challenges are about. If you would like to join the challenges, call (956) 381-9922 or visit the Family Summer Adventure Challenge Facebook page. Follow Peter Rasmussen (Team Peter Parker) all summer as he explores the various nature sites in the Valley through the RGV Family Summer Adventure Challenge.